New indoor pool, whirlpool, shallow pool, infrared sauna, Finnish sauna, Kneipp basin and billiard. Welcome to Hotel Gisserhof*** in St. Johann! We invite you to spend some relaxing days in the middle of the valley Tauferer Ahrntal, surrounded by high mountains, green meadows and forests. Enjoy the comfort and hospitality of our guesthouse, which are good for body and soul. 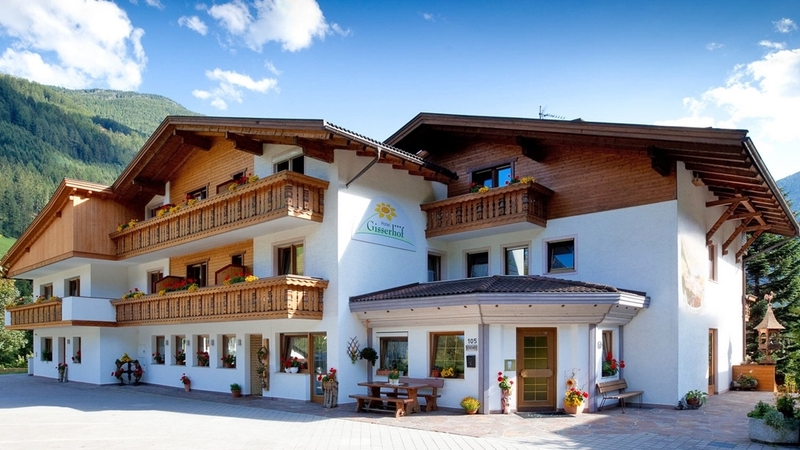 Our pleasant 3-star-hotel is located in the village St. Johann on the edge of the forest and offers ideal conditions for family holidays and travel groups. All guestrooms have shower, WC, bidet, hairdryer, satellite TV, safe, floor heating and balcony. In the dining-hall we pamper you with a rich breakfast, menus with several courses, weekly dinners and aperitifs. You will enjoy local and international dishes, accompanied by excellent wines of the region. Furthermore Hotel Gisserhof*** has a spacious spa and wellness area, a children's playground, billiards and table-top soccer. In the environs of our hotel there are plenty of possibilities for walking, hiking and biking tours. In winter a free ski bus stops in the vicinity and a cross-country ski run is only a few minutes away.